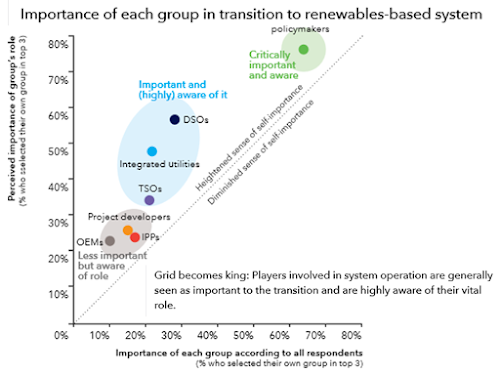 Policymakers and system operators place diverging demands on renewables Renewables developers are pulled in different directions. On the one hand, they must please policymakers: twothirds of respondents list politicians and policymakers in their top three most vital players in the transition to a renewables-based electricity system, and qualitative data stresses that securing political will depends on affordability. On the other hand, in a high renewables future, developers must also engage with the increasing challenges of system operation. ■ Gradually exposing developers to stronger market signals on the timing and location of generation. ■ Opening up ancillary services markets to renewables and other enabling technologies. ■ Considering market value and system costs when planning technology mixes. A rebalancing of rules – led by system operators and regulators, with developers’ support New rules will rebalance the opportunities and challenges for developers and system operators. Grid code refinement to maximise the capabilities of renewables can often deliver substantial system benefit at minimal cost. This should be done carefully: a heavyhanded regulatory approach should be avoided, and market-based solutions – including the new metric of market value – remain an equally important part of the solution. ■ Amending grid codes to make the most of sophisticated converter functionality of renewables. ■ Updating regulation to allow more innovative approaches, such as microgrids. ■ Increasing the emphasis on stakeholder engagement in the regulation of system operators. The energy trilemma cannot be easily solved within current boundaries Qualitative data hints that the electricity sector needs to become more interconnected with the wider energy system and with information and communications. Current high interest in energy storage, which 66% of respondents select as a top three lever for a high renewables future, is an example of the increasingly blurry lines between power, transport and heat. 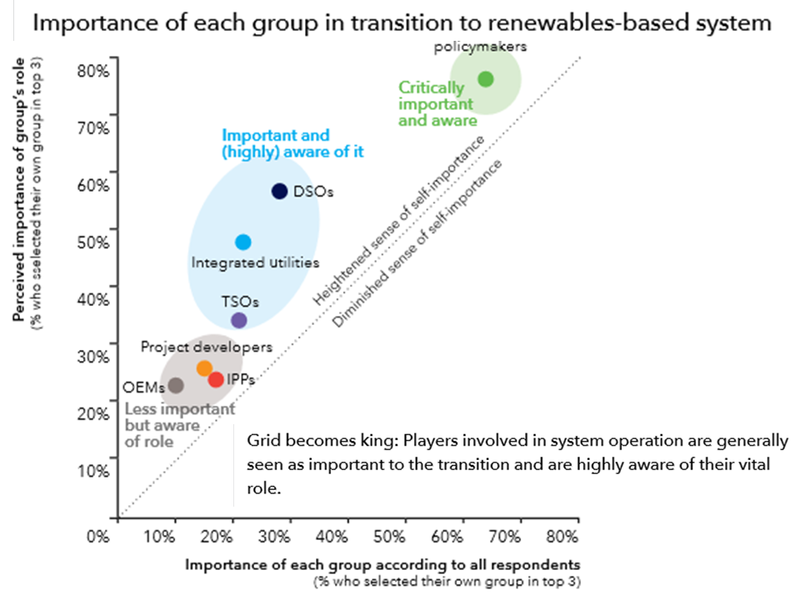 Meanwhile, respondents’ emphasis on smart grids underscores the role for IT in helping to manage the variability of renewables. > ■ Seizing the opportunities of ‘subsector arbitrage’ with heat and transport. ■ Partnering and upskilling in consumer engagement to stay relevant. ■ Defining a minimal set of specifications for smart energy systems. For each of these three dynamics, the solutions for a high renewables future demand a change in the way we think about the ‘integration’ of new technology. Ad-hoc changes to existing systems must give way to genuine systemic thinking, albeit that this systemic thinking should have a pragmatic flavour. We are prompted to take a broader view and to adopt more collaborative approaches as we move into an exciting electric future. We need to go beyond old metrics, beyond old rules and beyond old silos. In short: beyond integration.